The Cleveland Movie Blog: The Man From U.N.C.L.E. THE MAN FROM U.N.C.L.E. has all the classic Cold War Era stuff. Spys? Check. Nuclear warheads? Check. Slim-fit suits and big sunglasses? Check! Guy Richie’s 60’s spy vision is slick and mod, but his story? Tedious. The story is not particularly groundbreaking: undercover spies trying to intercept a bomb. Henry Cavilll (SUPERMAN) plays Solo, America’s top spy. Armie Hammer (THE LONE RANGER, SOCIAL NETWORK) plays Illya, Germany’s premier agent. Their countries unceremoniously pair the headstrong spies together, to the chagrin of both agents. Their mission is to find the criminals who have kidnapped a nuclear scientist before they can complete a nuclear warhead and take control of the scientist’s research. To track down the bomb, the spies enlist the scientist’s estranged daughter, Gaby, played by Alicia Vikander (EX MACHINA, A ROYAL AFFAIR). They zip line over the Berlin Wall, crack a safe, dodge gunfire, and have a car chase on an Italian island. Action sequences are sparse for a spy movie, but not disappointing. Coming off his SHERLOCK HOLMES run, Guy Ritchie directed and co-wrote this spy movie of a different era. This film has a mod style, split screen comic-type sequences, and a fun soundtrack. And it’s got that corny but cute humor that reminds me of watching HOGAN’S HEROES on Nick at Night. 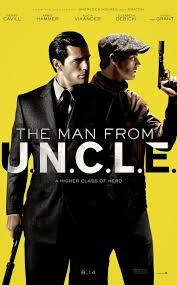 This movie is based on another TV show from the mid-60’s (though I don't remember catching THE MAN FROM U.N.C.L.E. on Nick at Night). Simple but fun moments like watching Solo enjoy a sandwich while watching his partner struggle with a boat chase and gun fight in the distance are charming, but can’t carry a nearly two-hour film on their own. And so the sum of the shiny parts seems superficial. If not the story, the performances were enjoyable. The movie’s poster places both of the film’s leading ladies in the background, but they stood front and center in the story. Vikander as Gaby was endearing and much more sassy than her haunting, but amazing, performance in EX MACHINA. Elizabeth Debicki (THE GREAT GATSBY) as the criminal mastermind and puppeteer, Victoria, is skillfully wicked and alluring. The men are well-cast too. Both look the part and add the right amount of 60’s slick to their secret agent characters. A fun side note, even though these characters are all specifically playing strong regional archetypes in this movie, none were cast as their native nationality. Cavill is British, but plays the American. Hammer is American, but plays German. A little extra humorous then, that Hammer would snobbishly refer to Cavill the American spy as “Cowboy.” The women, Vikander (Sweedish) and Debicki (French), also each take on new ethnicity. On the surface THE MAN FROM U.N.C.L.E. has the looks, the style and the talent. But beyond that, there’s a divide like – I don’t know – a certain eastern European wall. The writing doesn’t have the deeper appeal of a James Bond or an Ethan Hunt storyline. Their backstories were clumsily written in, but a connection to the audience can’t be scripted I guess. Or maybe it’s because this whole thing was just an exposition for a series – the final scene is nothing if not an open door for the next installment. Thankful for the fun transport to a more romantic time, but Guy Ritchie is kind of a boring host. Labels: action, Alicia Vikander, Armie Hammer, Cleveland OH, Guy Ritchie, Henry Cavill, Movie Review, The Man from U.N.C.L.E.